AE Link is a Lightwave plugin that makes a breeze of exporting Cameras, Nulls, Lights and rendered sequences from Lightwave to After Effects. You don't even have to import anything into After Effects. The innovative, non destructive, workflow ensures that what you do in Lightwave is mirrored in After Effects. Even complex scenes update in near real time. AELink is a Lightwave plugin that makes a breeze of exporting Cameras, Nulls, Lights and rendered sequences from Lightwave to After Effects. You don't even have to import anything into After Effects. 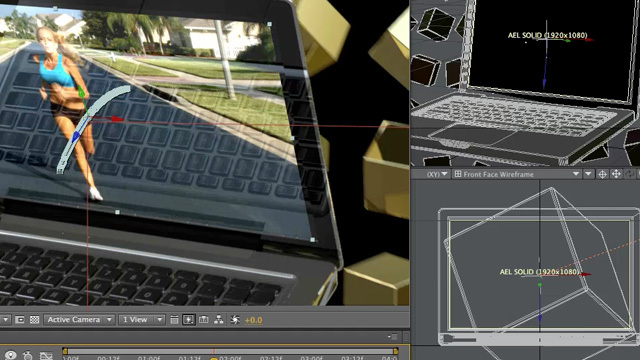 The innovative, non destructive, workflow ensures that what you do in Lightwave is mirrored in After Effects. Even complex scenes update in near real time. So glad we found this. It worked great on a PC, Lightwave 10.1 and After Effects CS5. It will be a life saver. Art Holden, Presenter Media Inc.
Dec 10th 2013 AE Link is still being developed. Next version will be a free upgrade for all current users. Current AE Link version works with Lightwave 11.0.3, 11.5 and 11.6 as well as all After Effects CC releases so far. It fully supports Lightwave's dongle-less licensing system. Tested both on Windows and MacOS. Please note that Auto Sync does not work properly on OSX Mountain Lion (or higher OSX version) regardless of AE / LW versions. Save time and deliver on time — Keep changing your Lightwave animations and see them update in After Effects with just one click. No need to bake anything, unless you are using IK or some motion modifiers. Reliable export — Name it: Hierarchies? Yes. Non-square pixels? Yes. Camera's focal length changes? Yes. AE Link is a battle-proven tool we used in countless productions. Its quaternion-based coordinate system converter ensures pixel perfect matches no matter how complex movements and orientations are. Simple workflow — Spend more time creating, and no time copying, pasting or looking for files. With AE Link's non-destructive workflow Lightwave talks to After Effects, that's why there are only two buttons: Sync Scene and Sync Selected. By their names you already know how to use AE Link. It would be hard to make it easier. Advanced features — AE Link's custom objects allow you to decide how Lightwave objects will appear in After Effects: as nulls, solids, or text layers. With or without motion blur. You can even use the motion from non-deforming object's vertices and turn all of them into solid or text layers. But, wait, for this to work you'll need two clicks. In order to obtain a perfect match, animated items in After Effects require a keyframe for each frame — a process called baking. Baking is a cumbersome and potentially destructive operation, that's why AE Link applies soft baking without altering the Lightwave scene. Soft baking can not work on items driven by IK or motion modifiers applied after IK in the Motion Options panel. Support for render buffer export and setup is likely to be introduced in the next minor version of AE Link, but there is no timeframe set yet. Point upgrades (V1.x) are always free. Macintosh: Lightwave 3D 9.6.1 or higher. Cocoa plugin, works both in 32 and 64 bit. Windows: Lightwave 3D 9.6 or higher. Both 32 and 64 bit versions are provided. Licensing: AE Link licenses are tied to Lightwave's hardware lock id (aka dongle) and you'll be required to enter your lock id after purchase. The entire purchase and licensing system is automated, so you are just a minute away from using AE Link. Details: AE Link is delivered as digital download only. Tech support is handled by VFX Wizard's online trouble ticket system. Minor version upgrades are always free. Please download the user guide linked below for an in-depth look at the plugin before purchase.